67146-1 Please look at this diagram. During the past 12 months, have you had pain in the area shaded on the diagram? 67133-9 Sometimes people have more than one type of pain. I am going to ask you a few questions about the pain that has been the most uncomfortable in the past 12 months. For the pain that was most uncomfortable, please show me where the pain was located. MARK ALL AREAS INDICATED. 67289-9 When you had this pain, was it continuous, or did it tend to come and go? 67136-2 When you had the pain, if you moved around, did you hurt more, less, or was there no difference? 67137-0 Have you ever seen a doctor about this pain? 67138-8 What did the doctor say caused the pain? 67140-4 Has a doctor ever told you that you had gallstones? 67141-2 What was the reason you visited the doctor the time that he told you that you had gallstones? 67143-8 Have you ever had medical treatment to dissolve or remove gallstones? Do not include surgery. 67144-6 Have you ever had gallbladder surgery? 67147-9 Did the pain that caused you to visit the doctor continue after your gallbladder surgery? 66177-7 Do you have hemophilia? 66178-5 Have you received cancer chemotherapy in the past four weeks or do you anticipate such therapy in the next four weeks? 66181-9 Was full sample obtained? 67181-8 Can exact number of adenomas be determined? 67203-0 If TNM Staging performed, what AJCC Cancer Staging Manual did you use? 67219-6 In the past 2 years, have you had a...upper endoscopy (esophagus/stomach)? 67220-4 In the past 2 years, have you had a (Virtual) CT colonoscopy? 67221-2 In the past 2 years, have you had a colonoscopy? 67222-0 In the past 2 years, have you had a sigmoidoscopy? 67223-8 Initial reason(s) you had a colonoscopy/sigmoidoscopy? 67225-3 Have you had any of the following clinician diagnosed conditions? 67229-5 How often did you have a burning feeling behind your breastbone (heartburn)? 67230-3 How often did you have stomach contents (liquid or food) moving upwards to your throat or mouth (regurgitation)? 67231-1 How often did you have pain in the center of the upper stomach? 67232-9 How often did you have nausea? 67233-7 How often did you have difficulty getting a good night's sleep because of your heartburn and/or regurgitation? 67234-5 How often did you take additional medications for your heartburn and/or regurgitation other than what your physician told you to take (such as Tums, Rolaids, Maalox)? This questionnaire is based on the Rome III symptoms-based diagnostic criteria for the functional gastrointestinal disorders (FGIDs). It can be self-administered and takes about 15 minutes to complete. Response formats for questions include yes/no responses, a five-point ordinal response scale for conditional questions (never or rarely to always), a seven-point ordinal response scale for frequency questions (never to every day), and a few other response scales specific to an item not fitting these (e.g., questions 76, 77, and 79). A series of "red flag" or alarm symptom questions are included at the end of the questionnaire (questions 82 to 93). Although these are not part of the diagnostic criteria, they are helpful in determining whether other diagnostic studies are needed to exclude other conditions/diseases that may explain symptoms captured in this questionnaire. A positive answer to any of these questions suggests a possibility of a diagnosis other than functional gastrointestinal disorder. This questionnaire (with its coding system) is intended for research and may be used to aid diagnosis. However, it is not meant as an instrument for self-diagnosis nor does it obviate the need for medical evaluation including history, physical examination, and limited laboratory and endoscopic testing of individual patients. The questionnaire is followed by a coding system that identifies provisional (or possible) diagnoses from the responses to the questions. The presence of an "alarm" symptom does not negate a diagnosis of an FGID, but it may indicate further inquiry or testing to rule out other conditions/diseases. Similarly, an indication of psychosocial difficulties will not alter the diagnosis but should prompt health care professionals to collect more information and possibly offer appropriate treatment. In the absence of biological markers and confirmatory tests for FGIDs, their diagnosis depends on applying these criteria, performing limited testing, and judiciously excluding other conditions/diseases (e.g., with other studies). Because there are no available tests to confirm the diagnosis of functional gastrointestinal disorders (FGIDs), the Gastrointestinal Working Group suggests that limited investigation be performed to exclude other conditions/diseases that may explain the reported gastrointestinal (GI) symptoms. These should include complete blood count, erythrocyte sedimentation rate and/or C-reactive protein, electrolytes, and liver function tests. In addition, it is recommended that serology for celiac sprue be completed for patients with diarrhea, a colonoscopy be completed for patients aged 50 years old or older with functional bowel symptoms, and an upper endoscopy be completed for patients aged 50 or older with upper GI symptoms. Additional tests should be considered based on presence of alarm symptom and clinical judgment of the provider. Many clinical scientists may prefer to study only one or a few of the FGIDs. To serve such a purpose, the questionnaire may be subdivided into question and coding modules for each of the disorders of interest: esophageal, gastroduodenal, gallbladder/sphincter of Oddi, bowel, chronic abdominal pain, and anorectal disorders. The Questionnaire on Pediatric Gastrointestinal Symptoms-Rome III Version (QPGS-RIII)* is an adaptation and abbreviation of the Questionnaire on Pediatric Gastrointestinal Symptoms (QPGS) (Walker, Caplan-Dover, & Rasquin-Weber, 2000; Walker et al., 2005) that was developed with the support of a grant from the Rome Foundation and that has undergone preliminary validation (Caplan, Walker, & Rasquin, 2005a, 2005b). The QPGS-RIII is an adaptation and abbreviation of the original QPGS. It was developed with input from the Rome III Child and Adolescent Committee and the Rome III Questionnaire Committee. Although the format and many items from the original QPGS have been retained, several new items have been included, and the scoring has been revised to reflect changes in symptom criteria based on Rome III. The questionnaire uses five-point scales to measure frequency, severity, and duration of symptoms. In addition, it may be scored to assess whether a patient meets the criteria for each of the individual functional gastrointestinal disorders. The questionnaire is followed by a coding system that identifies provisional diagnoses from the responses to the questions. The QPGS-RIII cannot substitute for the medical evaluation and clinical judgment required for an accurate diagnosis. *Developed by Lynn S. Walker, Arlene Caplan, and Andree Rasquin. This questionnaire is designed to administer to adolescents aged 10-17 years old. Please see the adult or child version of this questionnaire, as appropriate. The Gastrointestinal Working Group recommends performing serology for celiac sprue in patients with diarrhea. The Questionnaire on Pediatric Gastrointestinal Symptoms-Rome III Version (QPGS-RIII)* is an adaptation and abbreviation of the Questionnaire on Pediatric Gastrointestinal Symptoms (QPGS) (Walker, Caplan-Dover, & Rasquin-Weber, 2000; Walker et al., 2005) that was developed with the support of a grant from the Rome Foundation and that has undergone preliminary validation (Caplan, Walker, & Rasquin, 2005a, 2005b). The QPGS-RIII is an adaptation and abbreviation of the original QPGS. It was developed with input from the Rome III Child and Adolescent Committee and the Rome III Questionnaire Committee. Although the format and many items from the original QPGS have been retained, several new items have been included, and the scoring has been revised to reflect changes in symptom criteria based on Rome III. The questionnaire uses five-point scales to measure frequency, severity, and duration of symptoms. In addition, it may be scored to assess whether a patient meets the criteria for each of the individual functional gastrointestinal disorders (FGIDs). The questionnaire is followed by a coding system that identifies provisional diagnoses from the responses to the questions. The QPGS-RIII cannot substitute for the medical evaluation, and clinical judgment required for an accurate diagnosis. *Developed by Lynn S. Walker, Arlene Caplan, and Andree Rasquin. This questionnaire should be completed by the parent of a young child, aged 4 years old through 9 years old. Please see the adolescent and adult version of this questionnaire for ages 10 years old and over. The Gastrointestinal Working Group recommends performing serology for celiac sprue in patients with diarrhea. This measure is used to assess whether the respondent has had symptoms as a result of gallstones or gallbladder problems and to determine whether the respondent received treatment for the gallbladder problem. 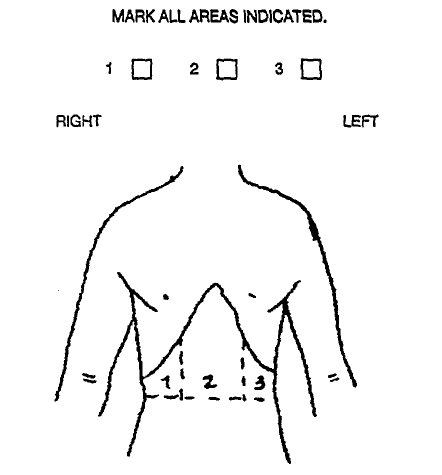 The interviewer will provide the respondent with a show card containing a diagram of the upper body before asking the first question. Numbers that appear in parentheses after the answer choice are a skip pattern and direct the user to the next question in the series. These questions will not identify asymptomatic gallstones. For a more detailed assessment of gallbladder disease in adults, including identification of subjects with asymptomatic gallstones, see the National Health and Nutrition Examination Survey (NHANES) gallbladder ultrasound protocol in the Gastrointestinal Working Group Supplemental Information. Description: Ruhl, C. E., & Everhart, J. E. (2000). Association of diabetes, serum insulin, and C-peptide with gallbladder disease. Hepatology, 31, 299–303. Description: Everhart, J. E., Khare, M., Hill, M., & Maurer, K. R. (1999). Prevalence and ethnic differences in gallbladder disease in the United States. Gastroenterology, 117, 632–639. Description: Centers for Disease Control and Prevention (CDC). National Center for Health Statistics (NCHS). National Health and Nutrition Examination Survey (NHANES) III. Adult Household Questionnaire. Section J: Gallbladder Disease. Pages 17-18. Text: CHECK ITEM. REFER TO AGE OF SP. Change Reason: Updated Time part to 12Mo to reflect the exact look-back period stated in the question in order to provide internal consistency to the term [201508 LOINC Clinical Committee decision] Changed "12Mos" to "12Mo" based on current LOINC model; Updated the PhenX ID from "PhenX." to "PX" in Survey Question Source field to align with the variable identifier used in the PhenX Toolkit. Text: Please look at this diagram. During the past 12 months, have you had pain in the area shaded on the diagram? Change Reason: Updated Time part to 12Mo to reflect the exact look-back period stated in the question in order to provide internal consistency to the term [201508 LOINC Clinical Committee decision] Changed 12Mos to 12Mo based on current LOINC model; Updated the PhenX ID from "PhenX." to "PX" in Survey Question Source field to align with the variable identifier used in the PhenX Toolkit. Text: Sometimes people have more than one type of pain. I am going to ask you a few questions about the pain that has been the most uncomfortable in the past 12 months. For the pain that was most uncomfortable, please show me where the pain was located. MARK ALL AREAS INDICATED. Text: During the past 12 months, what is the longest time that one episode of this pain has lasted? Text: On how many days in the past 12 months have you had this pain? Text: When you had this pain, was it continuous, or did it tend to come and go? Text: When you had the pain, if you moved around, did you hurt more, less, or was there no difference? Text: Have you ever seen a doctor about this pain? Text: What did the doctor say caused the pain? Text: Has a doctor ever told you that you had gallstones? Text: What was the reason you visited the doctor the time that he told you that you had gallstones? Text: Have you ever had medical treatment to dissolve or remove gallstones? Do not include surgery. Text: Have you ever had gallbladder surgery? Text: How old were you when you had your gallbladder surgery? Text: Did the pain that caused you to visit the doctor continue after your gallbladder surgery? This protocol uses two-step serologic testing of serum to determine the presence of antihuman recombinant tissue transglutaminase (TTG) and endomysial antibody (EMA). When both tests are positive, the subject is notified that they are positive for celiac sprue. The test is most accurate if patients have not been on a gluten-free diet in the weeks leading up to the assay, as a gluten-free diet may cause the serologic assays to normalize in many patients. It is important that the patients screened with this laboratory assay are eating a diet that contains dietary sources of gluten in order for the assay to be most accurate. Sources of dietary gluten include the grains wheat, rye, and barley. The Gastrointestinal Working Group (WG) also recommends performing the immunoglobulin A (IgA) and immunoglobulin G (IgG) antibody tests for more sensitivity. The National Health and Nutrition Examination Survey (NHANES) uses red-top tubes to collect 0.5 ml serum for the antihuman recombinant tissue transglutaminase (TTG)/ endomysial antibody (EMA) bioassay. However, the Gastrointestinal Working Group recommends consulting the laboratory that will perform the bioassay regarding the appropriate collection tubes to use. Description: Green, P. H., Rostami, K., & Marsh, M. N. (2005). Diagnosis of coeliac disease. Best Practice and Research Clinical Gastroenterology, 19(3), 389–400. Description: Dieterich, W., Laag, E., Schopper, H., Volta, U., Ferguson, A., Gillett, H., Riecken, E. O., & Schuppan, D. (1998). Autoantibodies to tissue transglutaminase as predictors of celiac disease. Gastroenterology, 115(6), 1317–1321. Description: Dieterich, W., Ehnis, T., Bauer, M., Donner, P., Volta, U., Riecken, E. O., & Schuppan, D. (1997). Identification of tissue transglutaminase as the autoantigen of celiac disease. National Medicine, 3(7), 797–801. Description: Centers for Disease Control and Prevention (CDC). National Center for Health Statistics (NCHS). National Health and Nutrition Examination Survey Questionnaire. Laboratory Procedures Manual. Hyattsville, MD: U.S. Department of Health and Human Services, Centers for Disease Control and Prevention, 2009-2010. Text: Do you have hemophilia? Text: Have you received cancer chemotherapy in the past four weeks or do you anticipate such therapy in the next four weeks? Text: Was full sample obtained? Service comment terms (Service comment, Service comment 02, Service comment 03, etc.) were requested by a lab to use as an OBX lab result message for user-defined text results. This measure uses existing medical records to obtain information about colorectal exams and procedures. This protocol may be useful to researchers studying people with polyps who are less than 50 years old. Data abstraction can be performed by anyone with proper training and does not require a trained nurse or physician. Description: Schoen, R. E., Pinsky, P. F., Weissfeld, J. L., Yokochi, L. A., Reding, D. J., Hayes, R. B., Church, T., Yurgalevich, S., Doria-Rose, V. P., Hickey, T., Riley, T., & Berg, C. D. (2010). Utilization of surveillance colonoscopy in community practice. Gastroenterology, 138, 73–81. Description: Schoen, R. E., Pinsky, P. F., Weissfeld, J. L., Bresalier, R. S., Church, T., Prorok, P., & Gohagan, J. K.; Prostate, Lung, Colorectal, and Ovarian Cancer Screening Trial Group. (2003). Results of repeat sigmoidoscopy 3 years after a negative examination. Journal of the American Medical Association, 290, 41–48. Description: Pinsky, P. F., Schoen, R. E., Weissfeld, J. L., Church, T., Yokochi, L. A., Doria‑Rose, V. P., & Prorok, P. (2009). The yield of surveillance colonoscopy by adenoma history and time to examination. Clinical Gastroenterology Hepatology, 7, 86–92. Description: U.S. Department of Health and Human Services. National Institutes of Health. National Cancer Institute. Prostate, Lung, Colorectal, and Ovarian Cancer Screening Trial (PLCO), Diagnostic Evaluation–Colorectum (DEC3/DCQ3) (version date: 07/01).